Home » Telugu » News » GES 2017: Samantha Akkineni to gift a handloom saree to Ivanka Trump during her visit. GES 2017: Samantha Akkineni to gift a handloom saree to Ivanka Trump during her visit. Samantha Akkineni will pick a handloom saree as a gift for Ivanka Trump that will be handed over by the Telangana government officials. Daughter of the President of the US, Ivanka Trump, is in Hyderabad for the Global Entrepreneurship Summit 2017 which is co-hosted by India and the US. Ivanka Trump landed in Hyderabad for the summit yesterday late in the night and will be in Hyderabad till November 30th, 2017. Ivanka will address the summit which will be attended by more than 1500 delegates from different nations across the globe. What has caught the attention of many is the relation between the summit and the Telugu film industry, which is quite an interesting one. Actors Ram Charan and Lakshmi Manchu will address the entrepreneurship panel which will include Ivanka Trump too. 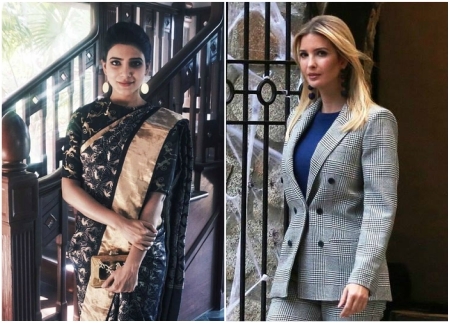 And according to latest reports, actress Samantha Akkineni will pick a handloom saree as a gift for Ivanka Trump that will be handed over by the Telangana government officials. According to latest reports, Samantha will herself pick a Gollabhama saree which is popular for its weaving style and is found majorly in Siddipet region in Telangana state. The Gollabhama saree style is more than 50 years old and is very popular for the inlay work by the handloom weavers from Siddipet region. It is not clear yet if Samantha Akkineni will herself present the gift to Ivanka Trump during her stay here for GES 2017. Samantha Akkineni is the Brand Ambassador for the Telangana Handloom industry and even endorses the weavers’ products many a time. what do actors have to do with the summit? shame on you india as actors are representing the country while there are other talents in india. There is a rule that the US President and their family cannot personally keep or use any of the gifts they receive while they are in office. It is considered that the gifts belong to the state not to the person. It’s just a nice gesture, that is all. Better give her a local made scarve or shawl that she can actually use! Not too long ago I had read that Ridhima Kapoor was planning to gift Justin Beiber and his mom some gold jewelry. Why? I doubt that these Hollywood celebs would go to such lengths to flatter a Bollywood star in the US. We Desi people go out of our way to make goray laug feel special and we don’t have such big hearts with our own people…unless they belong to a certain socioeconomic status or can benefit is in return in some way. I live in the US and one thing I can say about goray-folk is that they keep it fairly consistent….they don’t go to extreme lengths with gifts even among their own kind. Ivanka Jee will wear the sari perhaps only once and then stuff it in a closet where it will collect dust. She won’t make much use of it, so it will be a waste. It’s better to gift her something she can use. All ppl who really work for women empowerment, don’t require/expect gifts. Trump family is filthy rich and none of them respect women. But as per Indian tradition we don’t send guest with empty hands. May be that’s the reason. But she doesn’t deserve this hype. Why waste precious saree on her. Have you ever seen any of these foreign delegates use that gift in personal life? It’s stupid. I haven’t heard Hollywood stars getting in line to welcome Indian politicians and giving them expensive designer wear. So what is new? When such important figures come to Mumbai, bollywood is in the forefront. Now that these important people are in Hyderabad, the Telugu film industry personalities want to be part of this event. Only Indian celebrities hunger for this sort of attention. How is this even news?